Around cathedral square lie several of the most scenic sights of Vilnius. 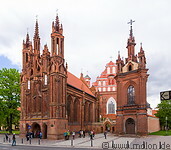 The Vilnius cathedral was first set up in the 13th century on the site of a pagan temple. it's facade looks like a Greek temple. Next to it lies the palace of the Grand Dukes of Lithuania, which was set up in the 15th century, demolished in 1801 and reconstructed between 2002 and 2009. The Gediminas hill overlooks cathedral square and is the site of a former fortress. 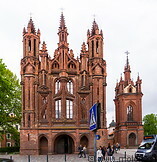 The church of St. Anne is a Roman catholic church built towards the end of the 15th century.